1) Action #237 (February, 1958) tells of newspaper magnate Henry Furst’s greatest scoop. Years of secret research have convinced Furst that Clark Kent is secretly Superman. So the rich man uses a powerful drug to fake his own death, conning Clark into revealing the secret to “a dying man.” Imagine the reporter’s chagrin upon receiving a phone call from the “dead man” gleefully detailing the EXTRA! edition his papers will be carrying. Thankfully, by a strange twist of fate, the same drug that induced Furst’s simulated death ends up scrambling his memories, to the point that he eventually decides that the memory of Clark’s confession is a muddled vignette from a clouded mind. 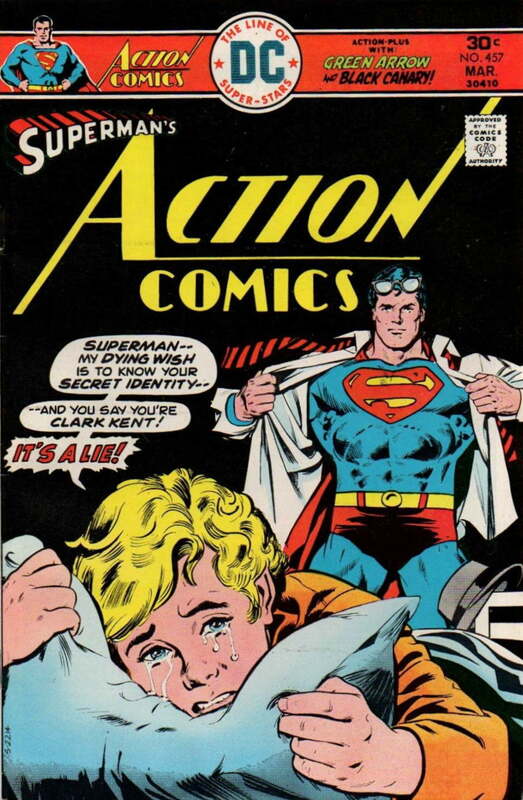 Sadly, just three years later, Superman falls for the same dying-man trick, in Action 276. This time the trickster is wealthy philanthropist John Kiley, really the head of the Anti-Superman Gang. He’s not after the journalistic scoop of the century; he uses the info to spring a Kryptonite trap on the Man of Tomorrow, a snare from which Superman (of course) barely escapes. But how to reverse Kiley’s fateful knowledge? 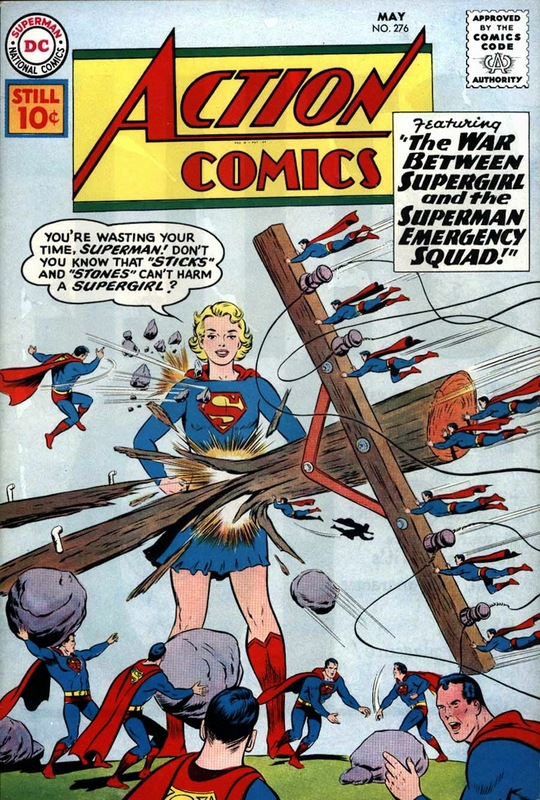 It takes the combined efforts of the Superman Emergency Squad and (then-unknown) Supergirl to convince the mobster that he’s seeing superbeings everywhere ... a sure sign of pharmaceutical delirium. 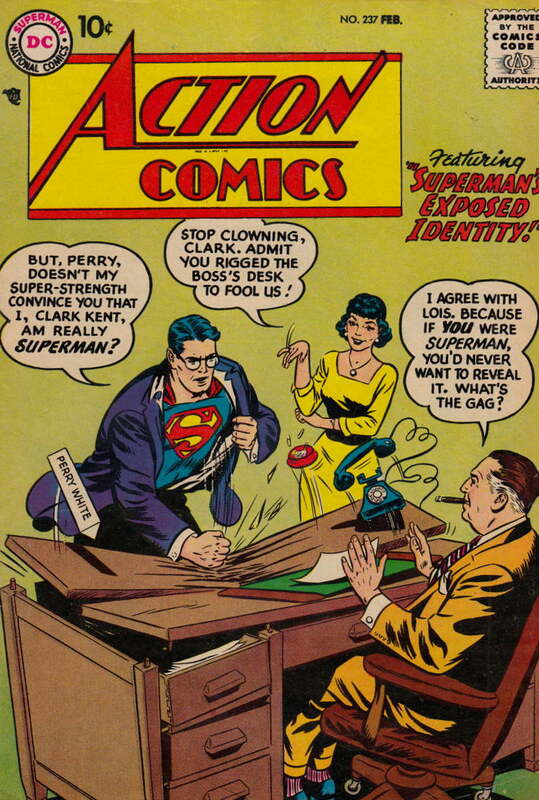 It stands to reason that Kent couldn’t be Superman, either. Whew! 2) Not all who learn the Great Secret have criminal intentions, of course. 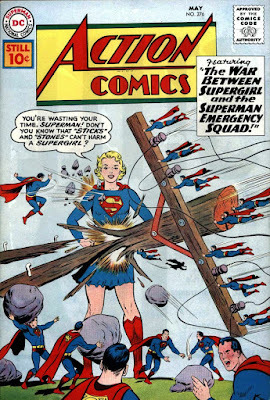 Superboy #90 (July 1961) narrates the momentous camping trip of Clark and best friend Pete Ross. 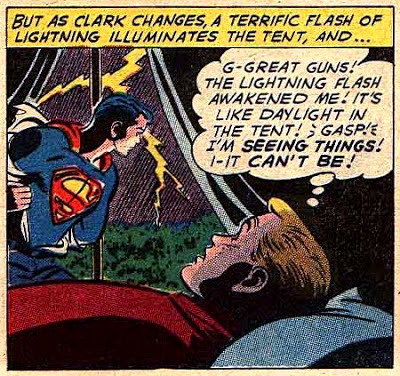 A clap of thunder awaken Pete just in time to reveal his friend Clark switching to Superboy. However, in a refreshingly compassionate twist, Pete vows silence. “I’ll never betray him or even tell Clark I know! He mustn’t be disturbed or hampered in any way by my knowledge!” Over the intervening years, Pete has even “accidentally” provided opportunities for his friend to slip away and change, undetected. So, in an attempt to save Jon’s life, Superman confesses his secret to the boy. Imagine his consternation when the youngster bursts into tears of disbelief, in the scene shown on the cover: “How do you expect even a kid to believe Superman is Clark Kent?” Eventually, Jon gets better, and is convinced by a strange sight: Clark Kent’s empty medicine cabinet. After all, Superman needs no toothpaste, aspirin, or bandages! 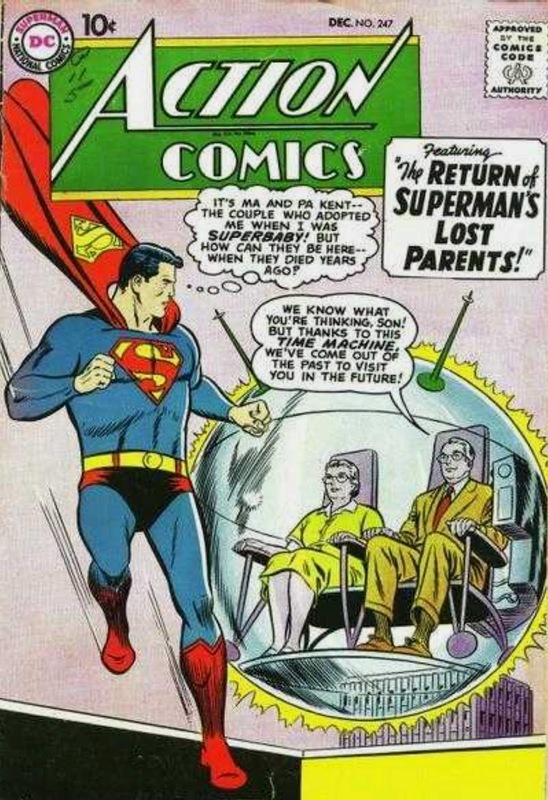 4) From 1959, Action #247 chronicles how the adult Clark is suddenly visited by the long-dead Ma and Pa Kent, here for a day by means of a time bubble on loan from a scientist friend. The subsequent evening of reminiscences completely convinces Clark that they are truly the Kents, and he freely discusses both identities with them. It’s only after his beloved foster parents have departed, that Superman recalls a flaw in their story. Sure enough, the next morning he receives a phone call from Cedric and Millicent Carson, who through shrewd research into Smallville town records have deduced the secret. Superman has just confirmed their theory! They demand five million dollars as a down-payment for their continued silence.